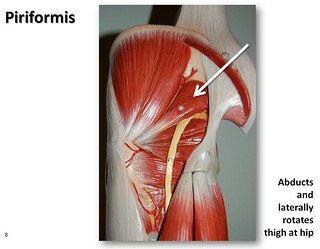 If you don’t know what the piriformis muscle is lets me first explain. The piriformis muscle runs from your triangle-shaped bone in your pelvis called the sacrum out to the top of your hip bone at a point called the greater trochanter. The action of the piriformis muscle is to help externally rotate your hip when walking. This is why runners can develop lower back pain, hip pain, buttock pain diagnosed as piriformis syndrome. There are lots of other muscles in your bum. The piriformis muscle is just one of them. Again the reason why particular this buttock muscle gets so much attention is because the sciatic nerve passes near it causing a trapped nerve in back pain condition called piriformis syndrome. Referred pain from a tight piriformis muscle can be in the left buttock or right buttock. This type of lower back pain can mimic other back pain conditions like: sciatica from a herniated lumbar disc, lumbar facet dysfunction, sacro-iliac joint dysfunction and a high hamstring muscle strain. This back pain exercise can be a great home treatment tool to start doing now. It is so easy to do that you could be sitting at your office desk and stretching your back and hip without anyone knowing your stretching. Watch the three videos below which show you how to perform the stretch correctly. As you can see in the first video when doing the muscle stretch it is important not to round your lower back. Keeping a lengthened, straight spine allows you to isolate the piriformis muscle at the hip joint. The general rule with stretching is to hold the stretch in a comfortable stretch position for 30 sec maybe repeat 2-3 times and do this throughout the day. You should feel a stretch on the side of the top leg. At a desk you can hide the leg underneath the desk and still lean forward which makes you look like your reading the computer screen. As a bonus sitting up tall fixes a slouched posture from sitting at the desk too long. This is why I also use it as an upper body posture exercise. You probably seen people in the stretch area of gym do this one or on a sports field warm-up. Good for how to stretch on a plane at the back of the cabin or when needing a quick stretch from standing all day.